A student in Angela Harris' kindergarten class at MPS school Martin Luther King Jr. Elementary smiles at the camera. Reporter Emily Files recaps the biggest Wisconsin education stories of 2018. Evers touted his education credentials. He has been head of the Department of Public Instruction for nine years and was a school administrator and teacher before that. 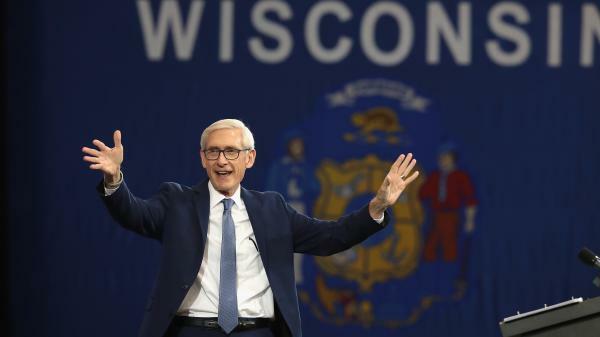 "It’s pretty simple, the people of Wisconsin have spoken," Evers said. "They know that the last eight years have not worked for our public schools." In the end, Evers ousted Walker by just a little more than 1 percentage point. Tony Evers at a rally leading up to the election. Evers’ proposed 2019-2021 DPI budget is a good indication of his education agenda as incoming governor. He is a public-school advocate, looking to invest $1.4 billion in the next two years. A big share of the increase would go to special education, mental health support and bilingual education. He wants to fully fund four-day kindergarten and funnel extra money to urban districts with the goal of closing achievement gaps. "We serve over 50,000 English learners in the state and that number’s growing. They should be our priority," Evers said in his September State of Education address. "But state aid to help them learn and succeed has been flat for over a decade. We serve over 120,000 students with disabilities in the state. They should be our priority." Evers is a Democrat and the legislature is Republican-controlled, so it is uncertain how much common ground the two parties will find on education spending. There is some evidence that Republicans want to increase school spending. Luther Olsen is a Republican senator who co-chaired a special commission exploring education funding. "We sort of lucked out at the right time doing this," Olsen said at the commission's final meeting in December. "Because when you do polling, education is an important issue for the public, so that gives legislators permission to do things." As Olsen implied, public opinion may help convince lawmakers to spend more on education. Marquette Law School polls leading up to the Nov. 6 midterms showed most Wisconsinites favor education spending over property tax control. Voters also sent a clear message on Election Day when they said yes to 94 percent of school referendums — a record-breaking approval rate. The 82 ballot measures asked residents to pay more in property taxes for local schools. Perhaps the biggest higher-education story in Wisconsin this year is the UW System merger. It is a major shift in the state’s public university system. Historically, Wisconsin had separate four-year public universities and two-year colleges. The colleges serve as a more affordable option where students can earn associate degrees or complete general education requirements before transferring to a more expensive university. The former UW-Waukesha is now a branch campus of UW-Milwaukee. But enrollment is on a steady decline across most UW institutions, and the system is struggling with tight revenue due to tuition freezes and cuts in state funding. Instead of closing the lowest-enrolled schools, UW regents approved a plan to make two-year colleges branch campuses of four-year universities. The plan is supposed to make the system more financially stable. The restructure officially began July 1 and is scheduled to take two years. Students in Milwaukee Public Schools began the school year with a new superintendent. Keith Posley took over on an interim basis after Darienne Driver left in the spring for a different job. The school board appointed Posley to the permanent position in October, with a $252,000 base salary. Keith Posley is the new superintendent of Milwaukee Public Schools. Posley has been with MPS for about 30 years, which he says gives him an advantage. "I know exactly what needs to happen," Posley said in an interview with Mike Gousha. "I don’t need to wait and find out where the worker bees are located, who’s going to do this, who’s going to do that ... So now, it’s all hands on deck. And we are running to make that happen." Posley's priority is a renewed focus on math, reading and writing. Improvement in those areas is sorely needed. The most recent state test results show just one in five MPS students is proficient in English Language Arts and even fewer meet the bar in math. The district as a whole has a state-calculated score of 57 out of 100, which means it "meets few expectations." Another education highlight: Milwaukee Journal Sentinel reporter Erin Richards has been taking an in-depth look at student turnover in Milwaukee and across Wisconsin. Her series Lessons Lost spotlights how rampant school switching is in many Milwaukee schools, and the challenges that poses to student learning and school environment.